�����Information & Liberation: Writings on the Politics of Information & Librarianship. SRRT is undertaking a huge shift in the delivery of our newsletter. Welcome to our first "electronic-only" edition of the newsletter. After a long discussion at Midwinter, we have decided that we would like to experiment with electronic delivery of the newsletter. What exactly does this mean? Well that's a good question. What we hope to do is cut down on the expenses associated with delivering a printed newsletter to our members before our annual and midwinter meetings. However, we understand that there are some members who prefer a printed copy of the newsletter and we would like to accommodate you as well. I'm also well aware that only a small percentage of our membership actually makes it to our conference meetings and you may have an opinion about our decision. I would love to hear from you and what you think about our shift to a primarily electronic version of the newsletter. Would you prefer a print copy? Do you like the change we've made? Please feel free to drop me a line at lpringle(at)plcmc.org. Thanks! Please vote! The polls will open on March 17 and will close April 24 at 11:59 CDT. This year's election will be the first almost entirely conducted on-line. Exceptions will be made for members who are homebound and do not have access to the Internet. If you need further information, please feel free to contact me at lpringle(at)plcmc.org. Or you can call me at 704-416-3002. You may also read the ALA press release about the upcoming election and new procedures here. See you at the polls! The changes I alluded to in my last letter are now upon us. As our first solely electronic edition, this issue looks even more different than the last issue. Since we are no longer publishing in print, there is no need to confine the layout and design of the SRRT Newsletter to what will fit on 8.5 x 11 inch pages in multiples of four. We have now switched to web publication in XHTML format, which should allow more flexibility and freedom for our content. With this being our first XHTML issue, the formatting may seem a little rough. I am still experimenting with the design and welcome feedback from you. Is the issue easy to navigate? Is it easy to read online? If you print it out to read, is the printout easy to read? Please share your thoughts and suggestions with me so that together we may shape the future of the SRRT Newsletter. Another important change that this issue brings is the move back to quarterly publication. The point has been raised that it would be helpful to have shorter issues published after conferences to deliver news from conference in a more timely fashion. Therefore, our new publication schedule will be March, June, September and December. Our next newsletter deadline will be Friday, May 8, 2009. Please send your contributions to me by e-mail in DOC, RTF, or TXT format. Images are welcome and encouraged. Indicate in the subject line of your e-mail that it is a SRRT Newsletter submission. I am looking forward to hearing from you! The year of 2009 has come upon us with tremendous change in our nation's history. The election of President Barack Obama was a huge victory for progressives everywhere who have fought for the equality of all. Many of the events that got us to this point in history occurred in the late 60s when Americans stood arm-in-arm and demanded change for all Americans as we sought to recognize our common humanity. The gender, racial and sexual identity politics of the U.S. were exploding at the seams during this time and the entire nation bore witness to the events surrounding this tumultuous period. Combined with the continuing escalation of violence as a result of the war in Vietnam, our nation was visibly divided during this era. The fallout from these events contributed to the birth of SRRT in 1969 and its quest to define itself as the social conscience of ALA. Forty years later, SRRT is still functioning as that voice for our profession at a time when the ideals of democracy or universal human rights for all humans are subject to debate. From the Israel/Palestine conflict to the dangers of global warming and climate change, we find ourselves not only engaging in battles for the rights of others, but making the case to our colleagues within the Association as to why SRRT is so important for librarianship. Although SRRT's role in our profession is deeply rooted in librarianship as an agent of social change, we still have much work to be done internally within ALA as we continue to promote our agenda of universal human rights and peace for all. We will continue to promote social responsibilities as a core value of librarianship and to provide a voice for alternative views within the Association. We must also continue to evolve as an organization. As technology continues to shape the world we live in, SRRT must strive to stay plugged in as well. This will play a major role in how we communicate with each other and maintain our relevancy. A lot of this will involve experiments including electronic delivery of the newsletter. We'll also wade into the brisk waters of meeting in open electronic forums. And unfortunately, these changes will take place during a trying period in our country's history as we're left to act on the financial turmoil that has spilled over into our profession. We've been humbled into accepting that many of us in the profession could lose our jobs, our homes and our sense of stability before it's all over. So as we celebrate our 40th anniversary, we should still be mindful that our battle isn't over. We are still at the beginning stages of the war. But we'll stay mindful of the prize—which is peace and a progressive agenda within librarianship. I'd like to take this opportunity to thank Alison Lewis, SRRT's outgoing coordinator who did her best to work with me and ensure a smooth transition. Alison and I spent countless days communicating to each other through email and phone as well our face to face time during the Midwinter session. Please extend your hearty thanks to her when you get a chance, because she worked extremely hard to keep us in harmony. SRRT's wonderful listserv manager, Laura Koltutsky, is ready to pass the job along to a new volunteer. Declare your interest in the position to SRRT Coordinator, LaJuan Pringle. A job description is being prepared for the position and will be placed on SRRT's website soon. The position does not require attendance at any ALA conferences and is perfect for someone who wants to become more involved and work for SRRT from home. The Librarians For Cultural & Ethnic Diversity/Social Responsibility (SRRT) are planning two sessions for this year's KLA/MPLA Joint Conference 2009 - Libraries: Dynamic People, Places & Ideas April 1 through 3, 2009. It will be held at the Hyatt Regency/Century II Convention Center, 400 W Waterman, Wichita, KS 67202. May I Please Blow Up This Reference Desk? has been accepted as a conference program. It is scheduled in room 201B from 3-4:50 on Thursday, April 2, 2009. Presenter Tracie D. Hall is most recently Assistant Dean at the Graduate School Of Library and Information Science at Dominican University. She is the Principal Founder of Goodseed Consulting Group. Formerly, Director of the American Library Association Office for Diversity. She has also worked at Hartford, New Haven Free, and Seattle Public Libraries. She was recognized by Library Journal as the August 2004 "Mover and Shaker." She holds a Bachelors degree from the University of California at Santa Barbara, a Masters degree from Yale University and a MLIS degree from the University of Washington. Three Dynamic Perspectives on Mentoring has been accepted as a conference program. It is scheduled in room 210C from 1:30-2:20 on Thursday, April 2, 2009. The Three Co-Presenters are: Nikhat Ghouse, Social Sciences Librarian for Anthropology, Global Indigenous Nations and Religious Studies, University of Kansas; Andrew Evans, head of Reference/Government Documents Librarian, Washburn University; Jennifer Church-Duran, Assisted Dean of User Services, University of Kansas. Do you have SRRT chapter news to share? Be sure to submit it for the next issue! Commonwealth Agricultural Bureau International (CABI) invited Fred Stoss, co-chair of the SRRT Task Force on the Environment (TFOE) and an Associate Librarian for Biological and Environmental Sciences and Mathematics at the SUNY University at Buffalo, to its recently created Editorial Advisory Board of CABI Environmental Impact. CABI created Environmental Impact as an online information service covering a wide variety of environmental topics affecting the agricultural sector worldwide. Fred's expertise as an environmental information specialist, especially related to global environmental change was cited for his inclusion in this effort. Fred also accepted an invitation to represent the TFOE on the Book Industry Environmental Council, which represents publishers, printers, paper mills, and others proposing environmental improvements in book publishing. The Council establishes criteria and standards for product labeling, develops standardized mechanisms for tracking environmental metrics, and makes recommendations for reducing the industry's impacts on climate change. The Council is a project of the Green Press Initiative (GPI). This past year Fred contributed a number of presentations across the country, including: "Earth, Wind and Fire @ your library: What Libraries and Librarians Can Do about Global Warming," and "The Green Press Initiative," American Library Association Annual Meeting; "Nature and the Environment @ Your Library." American Library Association Midwinter Meeting; "Librarians without Borders: The Information You Need Anytime, Anywhere," U.S. Environmental Protection Agency Environmental Information Symposium; "Perspectives on Sharing Environmental Data and Information in a Decision-making Model (by invitation). Annual Meeting of the EPA National Library Network; "Global Warming: What We Can Tell the Children," and "Nature Journaling Special Features: Sound Maps," New York State Outdoor Education Association 40th Annual Meeting. Fred also conducted a series of environmental education workshops for the Sierra Club, Environmental Education Committee: "Convenient Solutions to Global Warming," "Getting It Right by Writing It. Helping Kids to Write a Nature Journal," "How to Write a Nature Journal," and "Global Warming: What We Can Tell Children." "Green Libraries" was the theme of a presentation Fred delivered at the 2008 Annual Conference of the New York Library Association. Fred trained under Al Gore and the Climate Project as one of the "1000 Climate Messengers," and selected to deliver Mr. Gore's slide show on which the book and documentary film, An Inconvenient Truth is based. Fred discussed the science behind global warming and elaborated on solutions libraries are adopting to spread the word about global warming and efforts to make their libraries more environmentally friendly and reduce their "carbon footprints" at home and at work. Sustainable building designs, conservation of non-renewable energy, and LEED (Leadership in Energy and Environmental Design) were parts of this presentation. Fred also provided and received some first-hand examples of Green Libraries as the closing keynote speaker at the 2008 "Green Libraries Green Communities" conference organized by the librarians of the City University of New York and The New York Public Library at the Bronx Central Library. Fred and his daughter, Kaeti (a 2005 honors Art History/Archeology graduate of the University of Rochester and currently working on her BS degree in Earth Science and New York State Secondary Education Certification at the SUNY College at Brockport) published a paper in the trade journal, Online: "Heating Up for Global Warming Research and Policy" (Online. Vol. 32, no. 1, p. 37-42). The paper is the online featured work from this issue and found at: http://www.infotoday.com/online/jan08/stoss.shtml. Consider sharing your noteworthy accomplishments and achievements as an SRRT member. Submit your information for the next issue! SRRT's Task Force on the Environment continues its role as disseminator of important, cutting edge information to interested library people. At our Midwinter business meeting, we heard reports that our webmaster, Mary Feeney, has updated our site http://www.ala.org/ala/mgrps/rts/srrt/tfoe/taskforceenvironment.cfm and is working to improve our selection of outside links. We would like to find other volunteers to add additional content; contact Mary via the address listed on the web site if you would like to help. Our main activity for the coming two years will be conference programs; we are working to bring Denis Hayes, the co-founder of Earth Day, to help celebrate the 40th anniversary of that event in 2010. Meanwhile, we will celebrate our own 40th anniversary in 2009 with a round table discussion of veterans of the early days. Watch your conference program for more details. We look forward to seeing more environmentally-concerned librarians in Chicago! 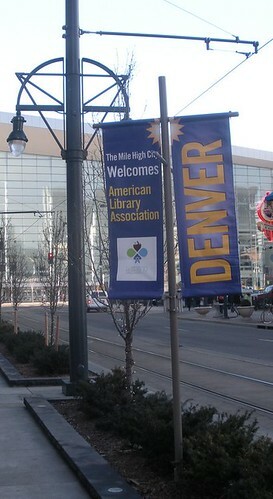 The Task Force met at ALA Midwinter Meeting in Denver in January 2009. Discussion at the meeting centered on recent events in Palestine, and planning for programming over the next two years. The recent bombardment, invasion, destruction and killing in Gaza by the Israeli government forces spurred members to write two resolutions. These were passed by the SRRT Action Council and moved at the ALA Council meetings at the Midwinter meeting this year. Details of their progress can be read in the ALA Council and SRRT Action Council reports. The resolution condemning destruction in Gaza and urging the US government to work towards disarmament was referred to, and watered down by, the International Relations Committee of ALA. The other resolution, though defeated in ALA Council, could lead to a SRRT meeting or program. This “One Conference, One Book” resolution, presented by Elaine Harger was written with the idea that ALA members are as ill-informed about Palestine as is the US public at large. This is reflected in the level of debate in ALA. US media present a very one-sided pro-Israeli view. In the interests of balance, the suggestion is that we promote the reading of a book sympathetic to the Palestinians to be discussed at a meeting of the ALA membership. There was broad consideration of which book might be chosen, and a bibliography could readily be produced. Suggestions for the “one book” include Jimmy Carter’s Peace Not Apartheid, Ghada Karmi’s Married to Another Man, Ilan Pappe’s The Ethnic Cleansing of Palestine. For ALA Annual 2009 in Chicago, we discussed our contribution to the 40th anniversary celebration of the founding of SRRT. The idea of producing a set of bibliographies on particular issues—perhaps 40 bibliographies for 40 years—was received with enthusiasm by the members present. The idea was presented to the committee organizing the anniversary celebrations and taken up by that group. For ALA Annual 2010 in Washington D.C we are planning to base a program on the status of children and their rights in the world. A series of topics quickly emerged, with room for expansion: children and war/ conflicts e.g. Palestine, Iraq, Afghanistan; physical and psychological effects children and migration (refugees, immigration, destruction of families human trafficking, child labor, child prostitution Economics); poverty and children, children incarcerated. Co-sponsorship opportunities, venues, speakers, resources are under discussion and development. This may be developed as a pre-conference program, or as a series of related events. Rainbow Project discussion at the SRRT All Task Force Meeting focused on two topics: the then-upcoming mediation between the RP, SRRT and GLBT-RT, and the revision of Rainbow Project policies and procedures. The status of the Rainbow Project and its location within the larger organizational structure of ALA was the focus of the first part of the meeting. Members were asked to give input to the chair regarding the best placement of the Rainbow Project. All members agreed that it was important for this project to maintain a relationship with GLBT-RT, and all members were pleased with how well the project had gone under the auspices of SRRT. All expressed a desire to see that relationship continue, and all members agreed that the best course would be a co-sponsorship shared between SRRT and GLBT-RT. Additionally, it was decided at the All Task Force Meeting that the Rainbow Project would explore sponsoring a breakfast at Annual 2010, to continue biennially in even years. The remainder of the All Task Force Meeting was to revise and streamline the policies and procedures. Changes to the policies were suggested and discussed at the meeting, with further discussion and a final decision taking place via e-mail in the weeks following the Midwinter Meeting. A meeting was held with representatives of the Rainbow Project, GLBT-RT, and SRRT, and facilitated by OLOS, to determine the status and final placement of the Rainbow Project within ALA. It was decided that the Rainbow Project would remain under the auspices of both SRRT and GLBT-RT. The members of the Rainbow Project met three additional times during the Midwinter Meeting to discuss nominated titles for the 2009 Rainbow List, and to determine the final bibliography of recommended titles. Three titles were unanimously supported, and discussion of the remaining nominations yielded a list with 36 titles for early, middle, and young adult readers. At the final meeting of the Rainbow Project, assignments were given for writing annotations. Also at the final meeting, members discussed the future membership of the Rainbow Project. Nel Ward was retained as chair; John Andrews was selected as chair-elect for 2009 and will take over the chair's responsibilities following Midwinter 2010. Three RP members stated that they would be unable to continue as members in 2009, and all members were asked to seek out potential candidates. Following Midwinter, candidates were selected to fill the vacancies in the Rainbow Project. Since Midwinter, we have had an incredible amount of positive feedback about the Rainbow List. The 2009 list is available at http://rainbowlist.wordpress.com/rl-2009/. Project members for the 2009 list were: John Andrews, Washoe County Library System (Reno, NV); Helma Hawkins, Kansas City Public Library (Kansas City, MO); K.T. Horning; Cooperative Children's Book Center, University of Wisconsin-Madison (Madison, WI); Arla Jones, Lawrence High School (Lawrence, KS); Natalie Kendall, Greeley Elementary School (Chicago, IL); Sharon Senser McKellar; Oakland Public Library (Oakland, CA); Michael Santangelo; Brooklyn Public Library (Brooklyn, NY); Victor Schill; Harris County Public Library (Houston, TX); Nel Ward, Chair (Newport, OR); and Christie Gibrich, Assistant to the Rainbow List for Public Relations and Support; Grand Prairie Public Library System (Grand Prairie, TX). In Denver's early morning snow flurries, many new participants and the faithful gathered at 6:30 a.m. in the Colorado Convention Center on Monday, January 26. They braved the weather and the strong desire for more sleep to get what one had called the “Midwinter spiritual jolt.” This year's observance marked Dr. Martin Luther King's 80th birthday and the 23rd anniversary of the national holiday in his honor. 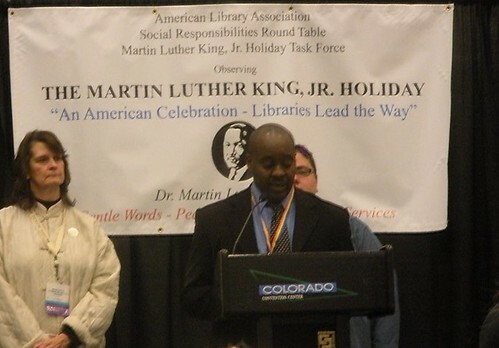 Moreover, it represented the tenth American Library Association (ALA) Sunrise Observance starting in San Antonio, TX by the Social Responsibilities Round Table (SRRT). It was also the ninth year of Co-sponsorship with the Black Caucus of the American Library Association (BCALA) along with World Book, Inc. With the theme, “A Testament of Hope: Remember! Celebrate! Act! - A Day On…Not a Day Off,” the program to honor Dr. King's life and achievements opened with a welcome from Co-sponsor Social Responsibilities Round Table which was followed by the singing of “Lift Every Voice and Sing” led by Musical Presenter Lorelle Swader, Director, ALA Office of Human Resource Recruitment and Development. ALA President Jim Rettig brought greetings and observations on the occasion along with Keith Michael Fiels, ALA Executive Director, and Jennifer Parello, Assistant Marketing Director, World Book, Inc. 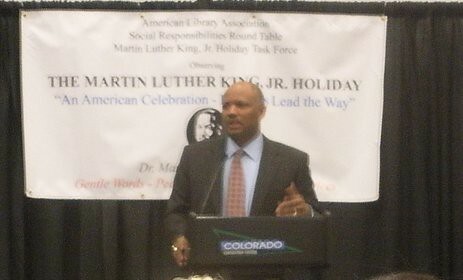 The featured speaker for the celebration was Colorado Commissioner of Education Dwight D. Jones who won statewide recognition for narrowing and eliminating the achievement gaps associated with minority children and students of low socioeconomic means. Appointed in June 2007 and currently a member of the Education Commission of the States (ECS) and the Closing the Achievement Gap Commission, Commissioner Jones recounted his path to such high accomplishment with incidents from his early life, including being mentored by a school librarian. As the first African American holding his position, he spoke of his gratitude to be both our guest and a beneficiary of Dr. King's legacy while encouraging ALA to continue its efforts toward equal access to information. Grateful acknowledgements are extended to World Book, Inc. for bountiful refreshments, American Libraries and ALA Cognotes for extensive news coverage, Satia Orange, Director, and the OLOS staff for stalwart support along with appreciation to all participants and attendees. First photo: LaJuan Pringle, SRRT Action Council Coordinator, welcomes attendees to the Martin Luther King, Jr. Holiday Sunrise Observance. Second photo: Dwight D. Jones, Colorado Commissioner of Education, was featured speaker at the Martin Luther King, Jr. Holiday Sunrise Observance. Photos courtesy of Nancy Garmer. It seems as if the ALA Council has again lost its memory of some of our association's core values. Although social responsibility is the very first point in the ALA Policy Manual, the Library Education Task Force gave us a document on “ALA's Core Competences of Librarianship” (2008-2009 CD #10.1) that failed to even mention social responsibility. The document also failed to include diversity even though diversity is the first of the FY2009 Programmatic Priorities (2008-2009 CD#13.1-13.2) as passed by the ALA Council. When I tried to insert the two words, “social responsibility” near the beginning of the document, the amendment was defeated by a vote of 52 to 99. The Diversity Council's effort to insert a section on diversity was also defeated in a similar manner. We will be working with the Diversity Council on new language to amend the core competences at the Annual Meeting in Chicago. SRRT wrote and approved for itself two resolutions on the Gaza conflict. Both were taken to the ALA Council. One was adopted in a very stripped down mode while the other was soundly defeated. The first was titled “Resolution on the Connection between the Recent Gaza Conflict and Libraries (2008-2009 CD#36). It referenced our successful previous “Resolution on the Destruction of Palestinian Libraries, Archives, and Other Cultural Institutions” (2001-2002 CD#18.8). The resolution noted ALA's membership in the US Committee of the Blue Shield, which is affiliated, with the International Committee of the same name. Blue Shield protects cultural property at risk in armed conflict. It also noted that the US recently ratified the 1954 Hague Convention for the Protection of Cultural Property in the Event of Armed Conflict. It went on to give the context of the Gaza conflict. While condemning terrorism on both sides, the resolution emphasized the massive death and destruction caused by US weapons used by the Israeli military. The action items included urging the US Government to work with Blue Shield, work for a permanent ceasefire, and work towards disarmament in the region. Unfortunately, our resolution was immediately referred to the ALA International Relations Committee (IRC). Since I am currently an IRC member, I was able to speak to the resolution at the committee meeting but with little effect. The IRC stripped almost all of the context out when it reported back to the ALA Council. Only two resolved clauses remained: one calling on the US Government to work with the Blue Shield and the other calling for the US Government to work for a permanent peace in the region. Even that was too much for the ALA Council. They amended the last resolved clause to call on the US Government “to continue to work for peace in the region.” I argued that the Bush Administration had obviously promoted war in the region but the amendment was adopted by about two to one. The final revision was adopted by a large majority (2008-2009 CD#18.1). Elaine Harger was the main author of the other document, “Understanding Gaza - One Conference, One Book - ALA Reads” (2008-2009 CD#37). The emphasis here was on educating librarians since the mainstream media continually supports US and Israeli foreign policies. The resolution called for an ALA Reads Working Group to select a book for the Chicago annual meeting that portrays the Palestinian people in a “fair, respectful, and accurate” way. It called for using some of the ALA Membership Meeting time to discuss the book, and to widely promote the project in general. Although Elaine gave a heartfelt presentation as only she can, discussion on the Council floor became very nasty when a speaker castigated SRRT for promoting Hamas. I rose to a point of personal privilege saying how offended I was by the speaker's comments. In the end very few councilors voted for the resolution. Although our first resolution was watered-down significantly and although we were soundly defeated on the second one, I think we accomplished more than first meets the eye. We raised the plight of Gaza in several high-level places throughout the meeting. If only twenty-five or thirty Councilors learned something, I think the project was worth the effort. Elaine is on the right track; until a large segment of the US population gains more understanding of the Middle East and raises its voice, we are likely to see continued US supported violence in the region. I must report one further point on US foreign policy. The ALA Washington Office issued a report on December 17, 2008 titled, “Opening the 'Window to a Larger World:' Libraries' Role in Changing America.” We also had a Town Hall Meeting in Denver on what to tell President Obama about libraries, and a list of issues was distributed before the meeting to stimulate discussion. Neither the report nor the list of issues mentioned any of our successful resolutions against the Iraq War, torture, or disinformation campaigns. I got a fair amount of applause when I raised these issues at the Town Hall Meeting, but I bet our Washington Office will continue to disregard these hard fought and won ALA policies. On the bright side, our successful effort to pass a sweatshop free purchasing policy for ALA at the last Annual Meeting (2008 CD#58) is being implemented. Keith Fiels gave us his implementation report (2008-2009 CD#9.1), although it was not discussed by the ALA Council in Denver. Council passed a “Resolution Commending President Barack Obama on His Commitment to Openness and Transparency in Government” (2008-2009 CD#20.1). The Council approved three new/revised interpretations of the Library Bill of Rights on “Challenged Materials,” “Restricted Access to Library Materials,” and “Services to Persons with Disabilities” (2008-2009 CD#19.1-19.3). Other notable actions include the “Resolution on Access for Physical Mobility Impaired Conference Attendees” (2008-2009 CD#38) and “Resolution on Accessible Computer Workstations at ALA Annual Conferences and Midwinter Meetings' (2008-2009 CD#39). I would also like to mention the “Resolution in Memory of Senator Claiborne Pell” of Rhode Island, who was responsible for the Basic Educational Opportunity Grants (Pell Grants), Library Services Act (LSA), the Library Services and Construction Act (LSCA), the Library Services and Technology Act (LSTA) which created the Institute of Museum and Library Services (IMLS), the National Endowment for the Arts, and the National Endowment for the Humanities. As a Rhode Islander, I was fortunate to grow up with a principled Senator in office. The most confusing, difficult and longest discussion took place around the Final Report of the ALA Task Force on Electronic Member Participation (2008-2009 CD#35). I will not try to explain all of the 16 recommendations here, but only note a few points. The first five recommendations were debated separately but this took so long that the rest of the items were discussed as a group in a committee of the whole. It is my understanding that these items will now be addressed by the ALA Executive Board taking into consideration all the comments made as well as the financial implications of implementation. The category of “virtual members” of ALA committees will be phased out in favor of full committee membership for all. I spoke against the recommendation that would let ALA Council meet virtually between meetings. The very complication of discussing this agenda item shows how important it is to thrash things out in person and in many venues. I also commented on the recommendation that would authorize Councilors to meet virtually if they could not attend an ALA Council meeting. The discussion in the report notes that this is necessary for emergency situations. I stressed that these circumstances should be true emergencies, not for example just budget problems or short staffing. Finally, a word on the ALA-APA, Allied Professional Association. Although there were no action items, there was a report urging us to contact our Senators to encourage passage of the Paycheck Fairness Act (S.182) and the Lilly Ledbetter Fair Pay Act (S.181). However there was no mention of the Employee Free Choice Act (H.R.1409), the card check bill. Amongst other provisions, this bill would make union organizing much easier, establish stronger protection against illegal employer tactics, and provide arbitration for first contracts. If a majority of bargaining unit members sign union authorization cards, the employer would be obligated to recognize the union instead of stalling for months or years under the current system. After I spoke about this bill, one Councilor upbraided me for wanting to take away a secret ballot. But the bill also provides a secret ballot election if one-third of the members say they want one. This is the AFL-CIO's main legislative priority. It is more than strange that the ALA-APA can't even mention it in the report of the ALA-APA Standing Committee on the Salaries and Status of Library Workers. As usual, I will be happy to try to answer any questions: akagan(at)uiuc.edu. Discussion of Gaza Resolution written by Al Kagan, Tom Twiss, and Max Macias. Title reworks previous IRC/SRRT Iraq War Resolution. Wordsmithing began in earnest until time consciousness prevailed. Motion: To adopt amended Gaza Resolution as SRRT resolution and forward to Council to pass as an ALA resolution. Moved by Elaine Harger, seconded by Jonathan Betz-Zall. Motion carries. Discussion ensued about tightening resolution language ahead of meetings so as to limit time spent on minute details. Elaine offered to post contact names of experienced resolution writers and other helpful info on SRRT web site for members with minimal experience wishing to write resolutions. Membership committee report: Elaine recounted the past and recent travails emanating from the decision at 2008 Annual to populate new members on to srrtac-l list as well as the srrtmem list. When signing up for listservs, SRRT memberss often use different e-mails than the contact e-mail addresses used for ALA membership, so people received traffic they didn't expect. Elaine will share this fiasco with John Jenner. Would be beneficial for SRRT to share this with ALA as a case study in what not to do. The problem for those anxious to unsubscribe is that in the SRRT e-mail footer the link doesn't take you to a live person to contact, just your management portion of the ALA listserv web site. And if you've never signed on to the site, you have to go through quite the rigmarole sign-up process. The inability to sign up for daily digest complicates the matter for those members overwhelmed by sheer volume on certain days. The SRRT Membership committee receives quarterly lists of members, so there may be opportunity to make personal contact for disgruntled unsubscribers. Continued in later thread of meeting. After several years of dedicated service, Laura Koltutsky has asked for someone else to be the SRRT listserv manager. Action Council Positions and vacancies: Tiffani Connor is running as representative to ALA Council to fill the large shoes vacated by Al Kagan. LaJuan noted there will be 3 additional vacancies on AC and we need folks to run. Mike encouraged those new SRRT members in attendance to consider running for AC, and after the responsibilities were read aloud and enumerated upon by present AC members, a few brave new SRRT members volunteered to go for it and put forth their names on the spring ballot! Listserv and other communication methods: LaJuan reported that the srrtac-l listserv was shut down on Friday, 1/23. Discussion followed with a suggestion to delete all addresses from srrtac-l, then send an e-mail out to srrtmem soliciting SRRT members to rejoin. The question about whether we could first ask ALA to wind back the clock to list status from before the e-mail address population explosion was raised. Melora reminded us of the ethical consideration of opt-in advantage over opt-out choice, and suggested there be an announcement on SRRT web page to wipe the slate clean. Another option is to contact all those people who requested to be unsubscribed, ask them to reconsider, and give them precise instructions. Motion: AC Coordinator will talk to ALA about reinstating list prior to the upload fiasco, and if that's not possible, we will start from scratch by wiping srrtac-l clean and solicit rejoining through srrtmem and web site announcements. Moved by LaJuan Pringle, seconded by Al Kagan. Motion carries. LaJuan reported going to roundtable coordinating assembly on 1/23 and learning how forthcoming ALA Connect social networking site may alleviate some of our communication/listserv difficulties and/or assist in roundtable internal communications, e.g. the discussion boards component of ALA Connect. Elections and Endorsements: Al reported that ALA Executive Board issued new election guidelines on Oct. 15, 2008. SRRT has often endorsed candidates for president and other officers. We were told a few years ago that units could not endorse candidates according to guidelines no one could ever locate. Roundtables and divisions can publish lists of their members running for office, and now individuals (including elected officers) can endorse anyone, but NOT in their capacity as ALA officials. In other words, SRRT cannot officially endorse candidates for ALA President, Council, or any other office. This stifles freedom of speech and begs the question of why candidates go around to committee meetings to stump in the first place. Motion: SRRT strongly opposes the current proscription that officers can't endorse candidates outlined in new election guidelines from 10/15/2008 and directs SRRT Councilor to bring this up in Council meeting. The SRRT Coordinator is also instructed to bring our objection to the policy up at subsequent Roundtable Assembly meetings. Moved by Al Kagan, seconded by Elaine Harger. Motion carries. SRRT newsletter: Alison Lewis reported that, after a year of negotiation, ALA has signed the contract with Wilson to index and provide full text access to SRRT Newsletter archive. Coming soon to a database near you! Discussion of increasing frequency of newsletter to more than twice per year: LaJuan explained newsletter editor Myka Kennedy Stephens' suggestion and willingness to publish quarterly. As a first step, there was a proposal for a brief communiqu� as a spring issue that has list of SRRT AC candidates and SRRT members running for other positions, and any significant midwinter business needing info to be communicated prior to ALA elections. Cost of print newsletter, even truncated format, quite prohibitive given SRRT fiscal status. Discussion about SRRT move toward electronic format for all future publications, but no definitive decision reached to completely cease print newsletter publication. Motion: publish SRRT electronic broadside in March 2009 just before the spring election in April. Moved by Mike Marlin, seconded by LaJuan Pringle. Motion carries. 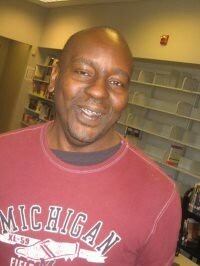 In brief: Jane Glasby reported that ASCLA wants to rewrite the Prisoners' Right to Read Resolution brought forth at 2008 Annual meeting. Jane will be engaged on this project and encourages anyone else who is interested to please contact her. Approval of 2008 Annual AC Minutes: Due to a glitch, Anaheim minutes were unavailable for review. Minutes will be re-sent to AC if rumors of Disney character Pluto eating them turn out to be unfounded. Motion: Approval of 2008 Annual SRRT AC minutes delayed until 2009 Annual SRRT meetings in Chicago. Moved by LaJuan Pringle, seconded by Jonathan Betz-Zall. Motion carries. Understanding Gaza: one conference one book, a lifelong learning inspired resolution written by Elaine Harger was introduced and discussed. With the intent of fostering understanding, resolution seeks to establish ALA Reads working groups, direct working group to select for Chicago conference a book sympathetic to plight of Palestinian people, invite author, set aside portion of general membership meeting to discuss the book, and make recommendations for future One Book conference forums. Lively discussion included various vantage points from cynical to enthusiastic to cautionary. Discussion was interrupted by visit from candidates and then resumed after mid-meeting break. Noted that Handmaid's Tale had been a one book forum 2003 conference in Toronto. Motion: Adopt “Understanding Gaza” resolution as SRRT resolution and authorize Elaine to bring to Council Forum and, based on Forum feedback, decide whether she wishes to introduce to Council meeting as ALA resolution. Moved by Jane Glasby, seconded by Al Kagan. Motion carries. Treasurer Report via speaker phone: Total current revenue $10,520 from dues and Library Juice Press royalties. Expenses (including projected programs for 2010 Annual Conference) are $10,736. This leaves us a balance of $284 for remainder of 2009. Semiannual newsletter costs approx. $4K, and past contingencies gone, e.g. loss of revenue from Coretta Scott King Book Award, we need to find additional methods for generating revenue. SRRT-Shirts: Tom Twiss described the t-shirt committee's research in preparing a design and associated costs for producing 200 t-shirts in time for 2009 annual conference and 40th anniversary of SRRT. Though the sale of t-shirts would raise some revenue, the primary goal and realization of the effort will be awareness rather than significant fundraising. Black shirt with white lettering designed by Lincoln Cushing pictures a dove holding a book and pencil and “SRRT, since 1969…” with names of SRRT Task Forces on back of shirt. Distribution would be primarily at Annual Conference booth, events, and programs. Shirt availability would be advertised in newsletter and on web site and SRRT members could take consignments to sell elsewhere. Design will be finalized based on input of this meeting's attendees and price will be set in the $15-18 range. Motion: SRRT authorizes the t-shirt committee to go ahead with design and purchase of the t-shirt project. Moved by Jonathan Betz-Zall, seconded by Alison Lewis. Motion carries. Newsletter: Discussed viability of continuing with print newsletter, despite fact some members may not have computers and that some print issues will be needed for archiving and indexing. If we were to go exclusively electronic, we would notify membership and offer print copies on demand for those without electronic means. Motion: SRRT Newsletter will become exclusively electronic with exceptions for archival requirements and special requests. Moved by Marie Jones, seconded by Nancy Garmer. Motion carries. 40th Anniversary Celebration/Rent Party: Report of plans underway to hold an off site event in conjunction with the Alternative Media Reception on Monday, July 13. Focus will be on history of SRRT and the importance of continuing the work of social responsibility within librarianship. We'll invite SRRT founders to speak about the origins of and glory days of SRRT and have live music and food. In addition to being a fundraiser this should be a starting point for renewing SRRT's vitality beyond the ALA watchdog role. In conjunction there will be articles on our history, 40 bibliographies for 40 years, Story Corps-type recounting by founders, t-shirts, etc. In addition to Anniversary Party committee members Elaine Harger, LaJuan Pringle, Jane Glasby, Nancy Garmer, and Mike Marlin, two more volunteers - Danielle Colbert-Lewis and Bill Turner - signed up to help. SRRT Dues Structure: Dues have been $12 for years, and many felt time to raise them. A spirited discussion ensued, and different proposals discussed. Motion: SRRT to change its dues structure to establish a $5 student/unemployed level, $15 regular membership, and $25 plus contributing membership category. Moved by Elaine Harger, seconded by LaJuan Pringle. Motion carries. Status of Rainbow Project List: After provisional task force status within SRRT and for past year, Rainbow has asked to be given formal task force status and agrees to adhere to all rules governing TF operations. Motion: SRRT officially accepts the Rainbow Project as a task force in compliance with SRRT rules governing task forces. Moved by Alison Lewis, seconded by LaJuan Pringle. Motion carries. Task Force Reports: Tabled due to time constraints and will be provided via listserv and electronic publications. Possible amendments to bylaws concerning the coordinator position: Topic still being researched by Theresa Tobin and Deidre Conklin and moved forward to Annual Meeting agenda. Electronic Meetings: ALA report to Council recommendations discussed, and general consensus is to use ALA Opal-Online software license for small SRRT committees to experiment with electronic format and test its effectiveness. Notice of such test meetings would be publicized on listserv when reestablished. Closing Libraries During Economic Downturn: Consensus that it's a very important topic and SRRT should take a position. Due to time constraints, item moved to 2009 Annual Meeting agenda. ����������4. transmits this resolution to the U.S. President, U.S. Secretary of State, all members of the U.S. Congress, the U.S. Committee of the Blue Shield, the library press, and other appropriate individuals and organizations. ����������5. instruct the working group to evaluate the event and make recommendations by Midwinter 2010 for its possible continuation. Tapscott, Don. Grown Up Digital: How the Net Generation is Changing Your World, New York: McGraw Hill, 2009. One could approach this book as a typical Net Gener by opening it randomly, perusing the pages in any order desired and by visiting www.grownupdigital.com to glimpse a bit of Tapscott's web persona. Reading the book with potential distractions in the background, such as music playing or conversation, while also accomplishing some instant messaging or keeping an eye on Facebook could follow. Tapscott explains why Net Geners manage this kind of multi-tasking differently than baby boomers do. He details how the Obama campaign made use of social networking. Although many are less supportive and even cynical toward these individuals, Tapscott stands up strongly and specifically against many negative criticisms for the way this group lives and deals with technology. He fully endorses them and gives very pointed advice for parents, educators and employers. He provides specific suggestions for better understanding and adapting to the needs, wants and extraordinary abilities of this “largest generation” which comprises 27% of the US population. “The bottom line is this: if you understand the Net Generation, you will understand the future,” he promises. The design of this first edition hardcover is particularly functional and fresh; it nicely reflects the expertise and enthusiasm with which Tapscott reveals his findings. Grown Up Digital includes extensive chapter notes, a lengthy bibliography and a very adequate index. When the book lays open, black text with blue headings and coordinated illustrations are nicely framed by fresh green fields showing from both insides of the dust jacket. The entire work is a caring tribute to the Net Generation who will, most likely, reshape the world. Durrani, Shiraz. 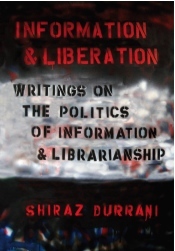 Information & Liberation: Writings on the Politics of Information & Librarianship. Duluth, MN: Library Juice Press, 2008. His writings reveal a deep commitment to social justice through his involvement with many different socially or governmentally oppressed groups. His descriptions of his own involvement with these groups provide a well-reasoned rationale for his inspirational visions for librarianship. The book is laden with theory which provides fuel for thought, but perhaps the most useful sections for the library practitioner are his concrete suggestions for improving services for many different disenfranchised groups-from teenagers to ethnic minorities. Shiraz Durrani began his activist career in his native Kenya as a librarian and writer, and political response to his writings caused him to seek political asylum in the U.K. in the 1980's. His findings regarding politically motivated suppression of information as both a journalist and a librarian shaped his writings over the course of his career. This background and his descriptions of personal experiences reminds the reader throughout the book of the social and political context in which librarianship resides, and the effect that librarians' complacency or activism can have on local groups in need of information which is impossible to find in a homogenized, outsourced library collection. The idea of information as text, as a tool of communication; as a force for liberation, and a tool of suppression by the state permeates the texts. ����������• By becoming involved with arts and cultural groups to redefine librarianship as part of the cultural process. Each general idea above is supported with a real-life explanation of a project that he has been involved with. Durrani's book would be useful for any librarian suffering from a professional spiritual crisis—some of the suggestions could be easily implemented as a pilot project that might give a library a renewed sense of place and purpose in the community. Sections of the book would be equally valuable for library students and faculty, in courses such as information ethics and program planning. 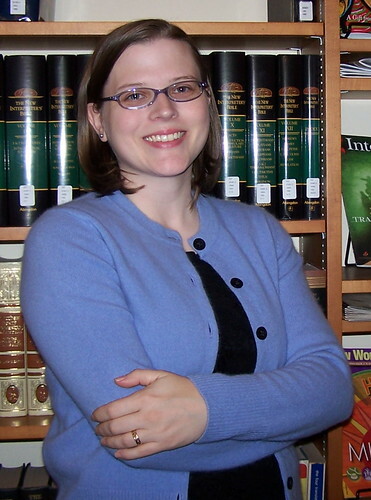 Emily Drabinski, last issue's reviewer for Questioning Library Neutrality (page 12) is Reference/Instruction Librarian at Long Island University, Brooklyn Campus. The date information for Issue 164/165 should read December 2008/January 2009. This resolves the inconsistency between the masthead and the running footer.